The FTT conical radiator furnace attachment is intended to be used to extend the usefulness of the NBS Smoke Chamber beyond testing to ASTM E 662, so that the same chamber can be used to test to ISO 5659 part 2, the IMO Fire Test Procedures Code, ASTM E 1995, and NFPA 270. While the furnace for the ASTM E 662 test is able to be used exclusively at an incident heat flux of 25 kW/m2 and with a test specimen in the horizontal orientation, the conical radiator furnace can be used at incident radiant heat fluxes of up to 50 kW/m2, and with test specimens in both the horizontal and vertical orientations. 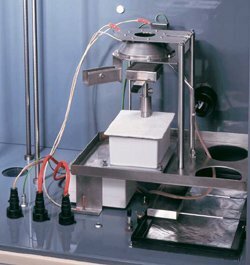 This is an important feature when testing thermoplastics and other melting and dripping materials. Variable heat flux range between 10 and 50 kW/m2, in horizontal and vertical orientations. Simple installation and removal from NBS smoke chamber (ASTM E 662 test apparatus). Supplied with its own control unit, allowing installation in all existing smoke chambers. Pilot burner is fitted with spark ignition and gas safety alarm and cut-out device. Instrument supplied complete with heat flux meter. Instrument supplied with housing to fix position of meter accurately to within 25 mm below the base of the cone heater. Available with a load cell device to enable the user to monitor mass loss continuously during the test. Note: This is not a complete instrument. It requires an NBS Smoke Chamber.